My wife and I have enjoyed observing the various migrating butterflies that frequent the flowering butterfly bushes in our backyard. We had the three shrubs planted this spring. The fragrant, white blossoms have attracted several varieties of butterflies. I especially enjoyed watching this Common Buckeye flit from flower to flower. I liked how the sun cast a shadow of the flower onto the Buckeye as it enjoyed the sweetness of the blossom. “Fragrant Shadow” is my Photo of the Week. From little on up, everything about butterflies intrigued me. The sizes, shapes, colors, flight patterns, unpredictable behavior around flowers, they all got my attention. They still do. 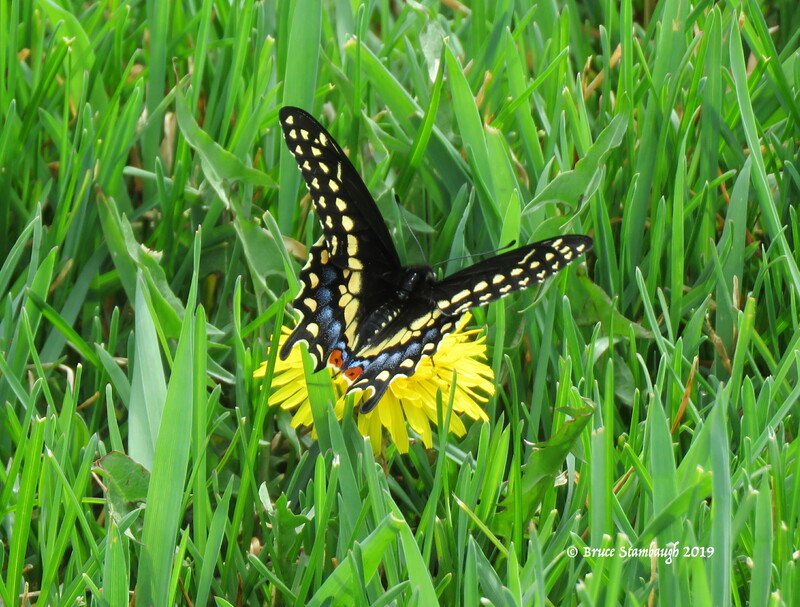 In August, when late-summer wildflowers are in full bloom and butterflies are migrating south, I am awestruck each and every time I see one of these flying beauties. Even though I know certain species of butterflies frequent woodland habitats, I am always amazed when I see them flitting among stands of mixed hardwood forests. Butterflies seem to be able to find blooms that we humans ignore. Perhaps that’s a lesson for us. Slow down. Take notice of your surroundings. Enjoy what you discover. Sometimes it takes a butterfly to guide you to the flowers. 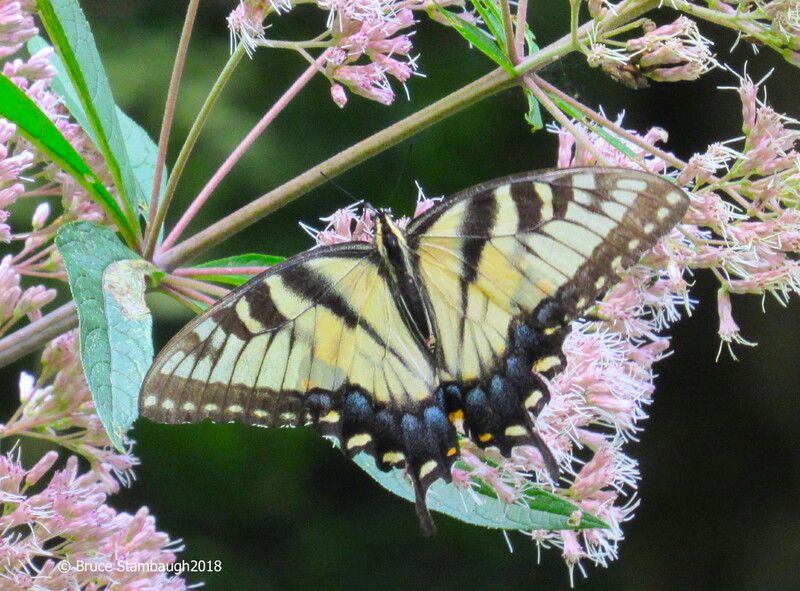 That was not the case, however, when this beautiful female Eastern Tiger Swallowtail butterfly lighted on this Joe Pye weed blossom. Joe Pye weeds grow to be six-feet tall, and their multi-headed flowers are lovely, fragrant, and serve as butterfly magnets. Other pollinators love them, too. I used my telephoto lens to capture this shot recently in southeast Ohio. 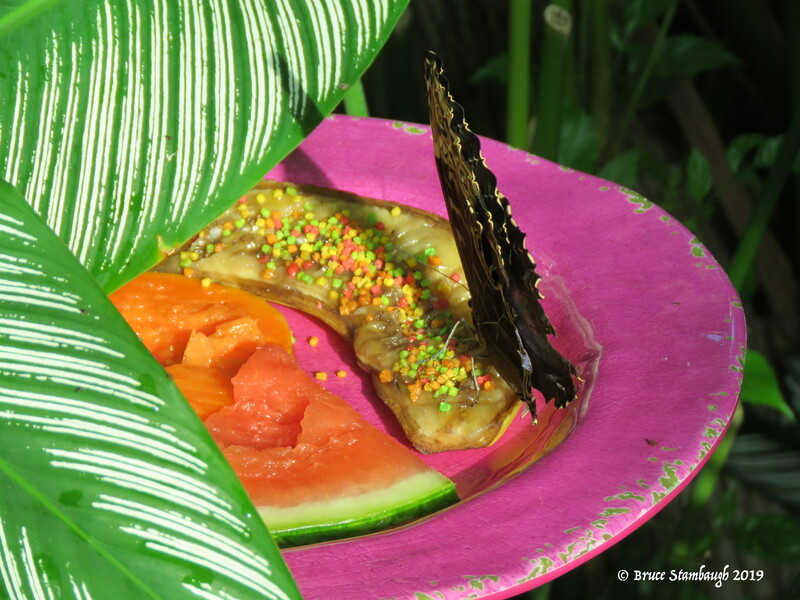 “Butterfly Season” is my Photo of the Week. Brown on Yellow and Green. Butterflies and flowers are made for one another. 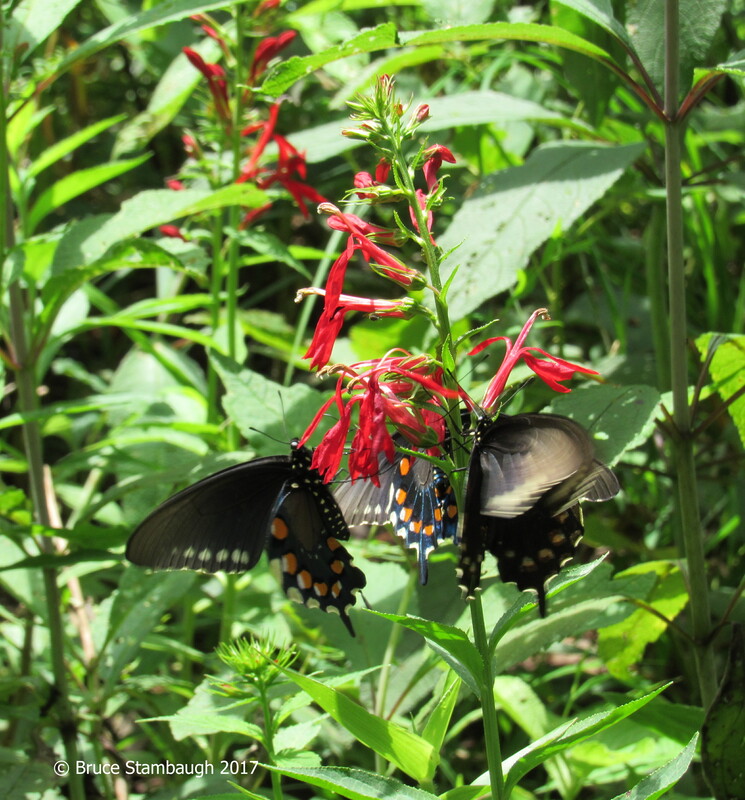 On a recent hike in Virginia’s Shenandoah National Park, many wildflowers were in full bloom, and from their joyous, creative aerial dances the butterflies couldn’t have been happier. Little skipper butterflies were most abundant. 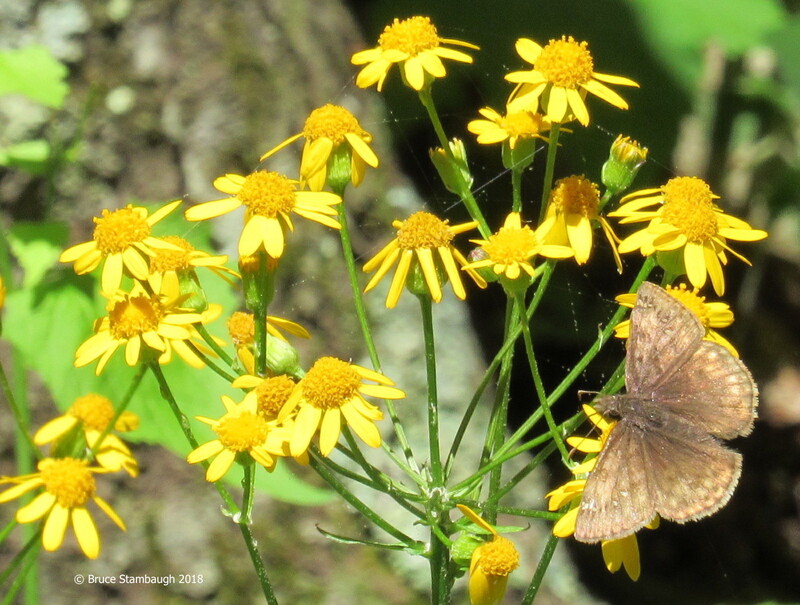 I found this one, which I believe to be a Confused Cloudywing, flitting from bloom to bloom on this patch of Golden Ragwort, a daisy-like flower. The afternoon sun nicely illuminated this invigorating scene. “Brown on Yellow and Green” is my Photo of the Week. Have you seen them? Fall’s murmurations are everywhere, or at least they were. They can be as fickle as fall weather. In fact, it’s autumn’s cooler temperatures and shorter daylight hours that often spur them on. European starlings create the defining form of murmurations that are often caught on video. Massive, migrating flocks of starlings whirl, dance, gyrate, and swirl, darting high and low, turning seemingly indiscriminately in the sky. One minute they mimic a ballet dancer, the next a fearsome Halloween monster. Sometimes they perform over land, other times they maneuver above great bodies of water. Either way, their machinations mesmerize human observers. These starling murmurations, so prevalent in the fall, appear cloud-like, pulsating as if scripted to a choreographed symphony. They change direction and tempo, moving from Beethoven’s measure to Springsteen’s beat. I once saw a murmuration where thousands of starlings turned and twisted like a tornado, so much so that other drivers also pulled over to watch the show. As magical as they are, the starlings cannot claim a patent on this fascinating phenomenon. Though not as showy or perhaps even as noticeable, other creatures great and small participate in their own migratory matinees. A recent Sunday afternoon sabbatical on a hilltop brought me to that conclusion. October’s bright afternoon sun bathed the land in warmth and beauty. I couldn’t have been happier. 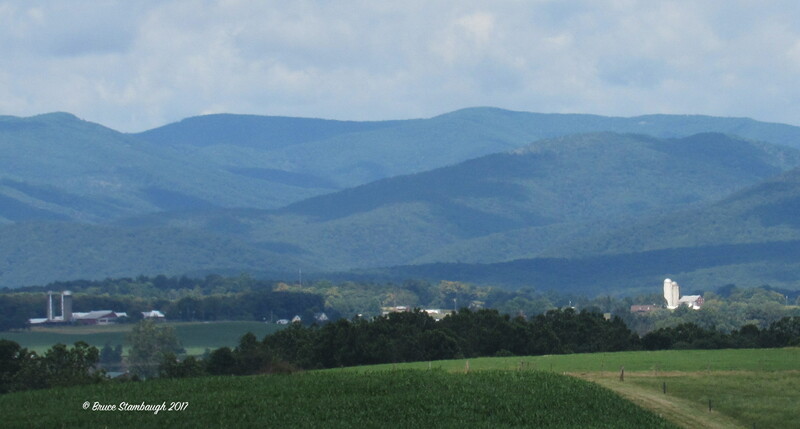 To my west, the Allegheny Mountains stood eternal, the hazy blue boundary line between Virginia and West Virginia. 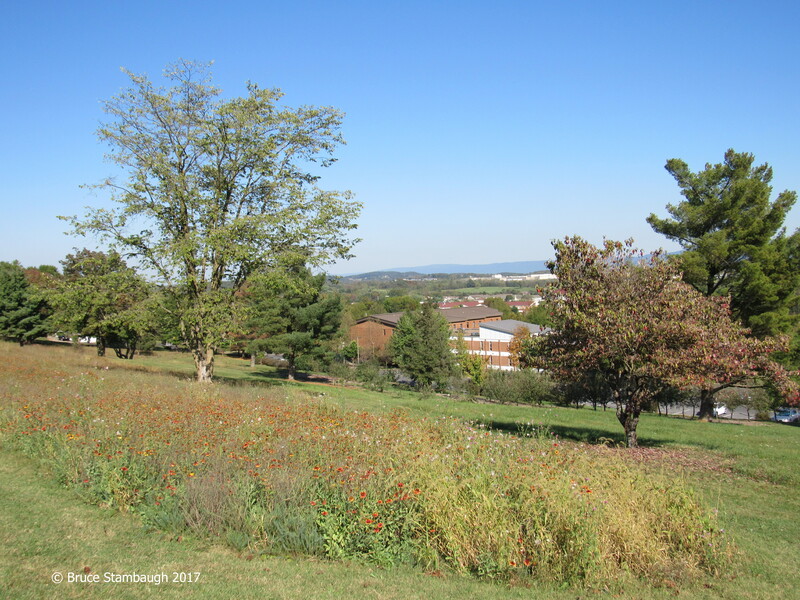 To the east, the Massanutten Mountain held watch over the city of Harrisonburg, which hummed with its usual busyness. As pleasant as that was, the setting became secondary to the murmuration activity in the lovely hillside meadow before me. 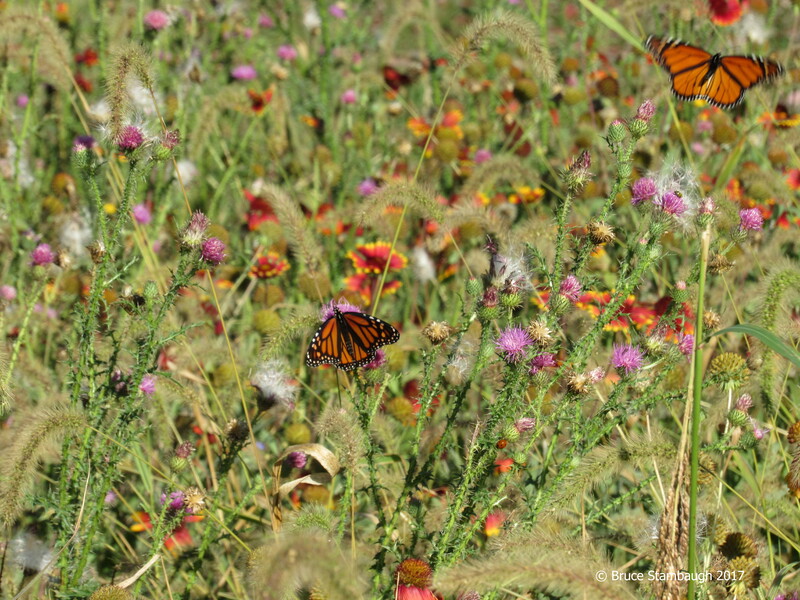 In its last days of seasonal, colorful productivity, hundreds of butterflies flitted everywhere. Multiple species competed for the blooms they far outnumbered. Thousands of honeybees, bumble bees, and beetles also joined in the frenzy for the limited floral offerings. Though they weren’t captivating clouds of whirling birds, each insect species had its own style. Butterflies chased butterflies. Bees buzzed butterflies, usually unsuccessfully. It wasn’t uncommon for a ladybug, honeybee, a Monarch, and a Painted Lady butterfly to all inhabit the same blooming wildflower plant, appropriating whatever they could for their journey or hibernation ahead. Overhead, turkey vultures sailed on rising convection thermals, additional byproducts of the generous sunshine heating the cooler landscape. Beyond the urban trees and down the hill, a red-shouldered hawk shrieked its call in an attempt to flush songbirds from their protective cover. American robins appeared with only abbreviated chirpings. Silent and absent since their last summer nestings, robin congregations bobbed on yards and scavenged crabapple trees for any morsel of energy to wing their way to milder winter climes. An eastern phoebe launched from a solitary dogwood tree loaded with bright red berries. The bird had no interest in them, however. Instead, it captured an unsuspecting damselfly, and returned to the same perch in the same tree, wagged its tail one more time and disappeared. On the way home, a rather lopsided V winged across the last of the sunset’s orangey glow. Even with car windows closed, I could distinctly hear the geese honking as the darkening sky absorbed them. At day’s end, I was elated to have observed a few of the other forms of nature’s murmurations, each with their own flair, their own personal signature. What murmurations of fall have you seen? Look sharp. They’ll soon be gone, replaced by the coming season’s institution of slumbering stillness. The Big Meadows area of Shenandoah National Park is a big, wide-open prairie-like saddle tucked between the park’s hardwood forests. It’s about midway along the Skyline Drive in Shenandoah N.P. According to a park ranger, no one is certain why the meadow is even there. No matter. It is, and the wildlife loves it. In the summer, Big Meadows is especially a haven for songbirds and insects. 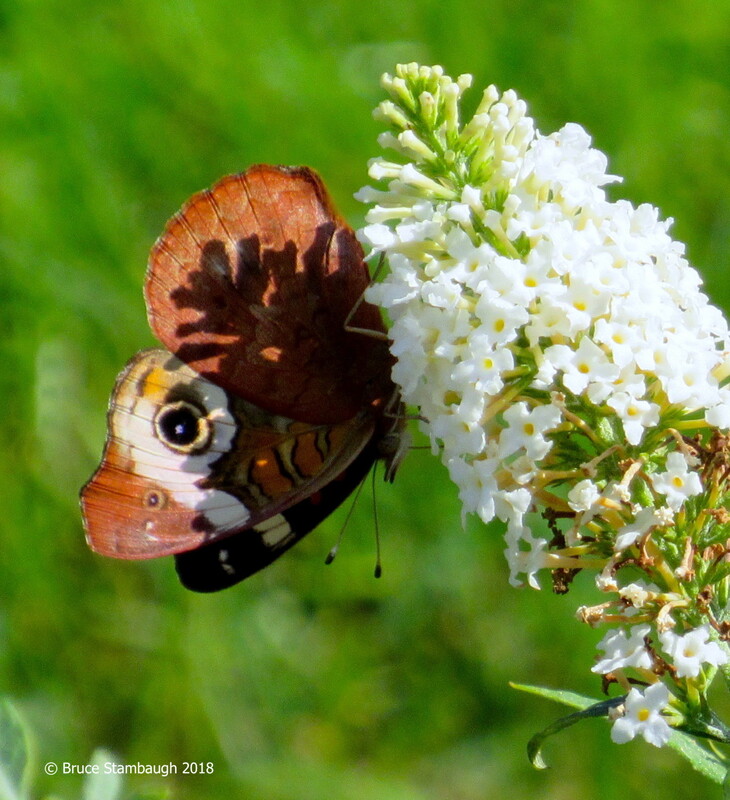 Bright and fragrant wildflowers serve as food and habitat for the beautiful butterflies. 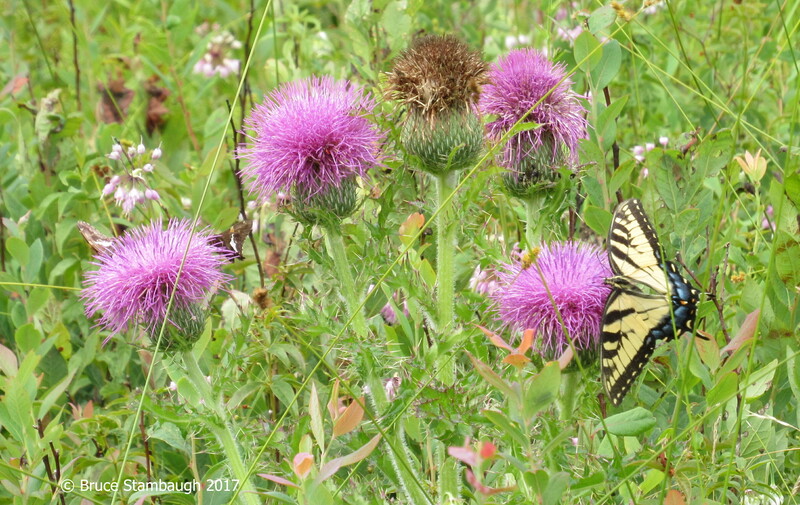 These thistle blooms were a magnet for this pair of Silver-spotted Skippers and this female Eastern Tiger Swallowtail. “Summer Colors” is my Photo of the Week. 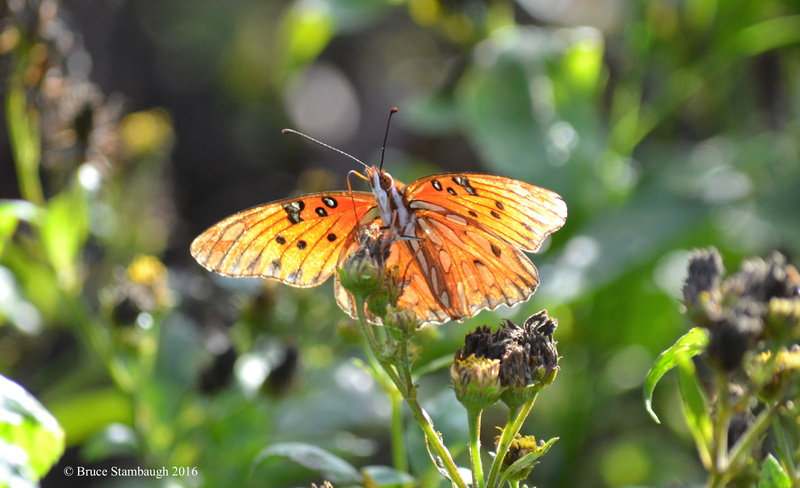 I was fortunate to catch this Gulf Fritillary as it landed on a flower in a nature preserve in northeastern Florida. The late afternoon sun brilliantly backlit the beautiful butterfly’s stunning orange and black pattern. Without being too poetic, the butterfly seemed to be sharing the sun with its absolute radiance. I thought this photo served as a warm welcome into a New Year for everyone. 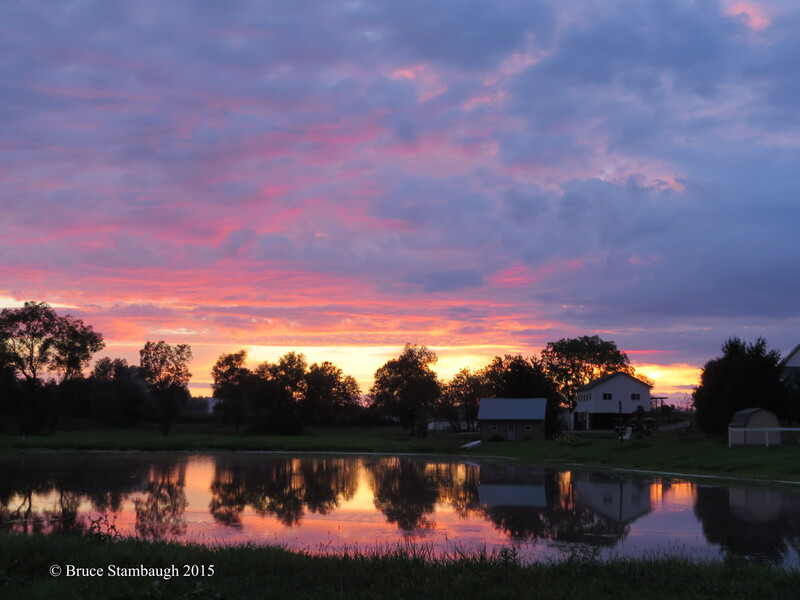 “Sharing the Sun” in my Photo of the Week. Where did summer go already? 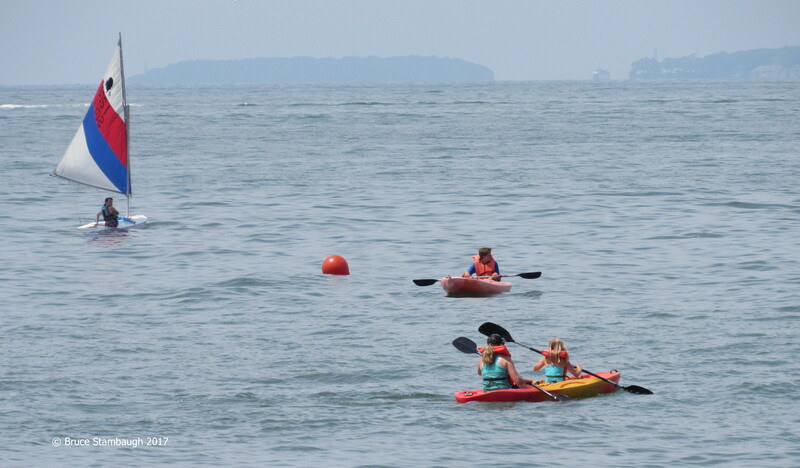 It seems like only yesterday that we were asking ourselves, “When will summer arrive?” I think that was in June when it was still cool and very wet. Well, a lot has changed since then. It seemed like the summertime months turned on themselves. It was a Jekyll and Hyde summer to be sure. The persistent rains of early summer suddenly ceased. 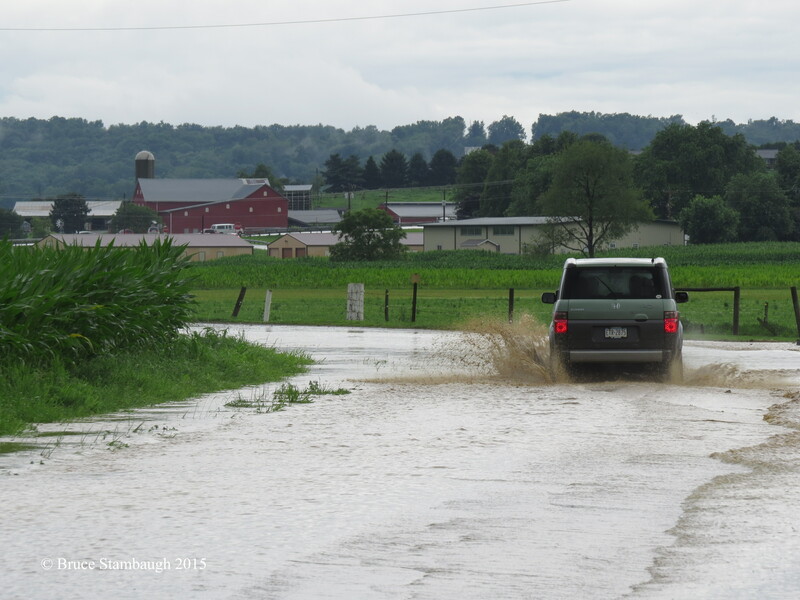 After the deluge that created localized flash flooding in Holmes County on July 14, regular rains were scarce. We lapsed into a dry spell that lasted too long to help the corn kernels swell with sweetness. Initially, truck patches struggled with mildew, mold and rot in the chilly dampness of early summer. Later, though, as crops matured, their unquenched thirst did them in. They ripened ahead of schedule, withered on the vine or failed to produce the desired yield. So here we are, the autumnal equinox upon us, and we’re wondering, “Where did summer go already?” As humans, we can be as fickle and contrary as Ohio’s crazy weather. It’s in our nature, and we have the grievance gene working overtime. Therefore, now that September is waning, it seems only fair to wonder what happened to summer. My best answer is, “I don’t know.” I do know, however, that the signs of summer’s end have shown for some time. 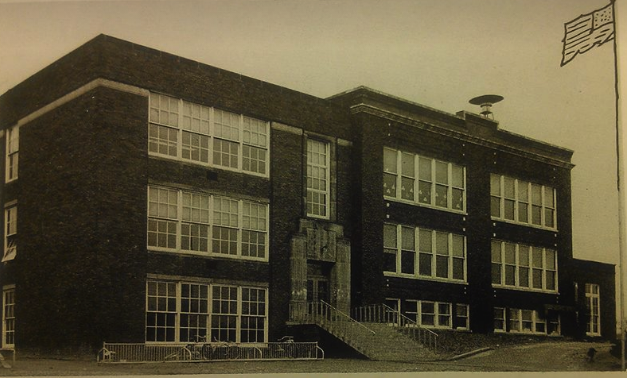 School started weeks ago for many students, always a sure omen of summer’s demise. Summer flies other white flags, too. 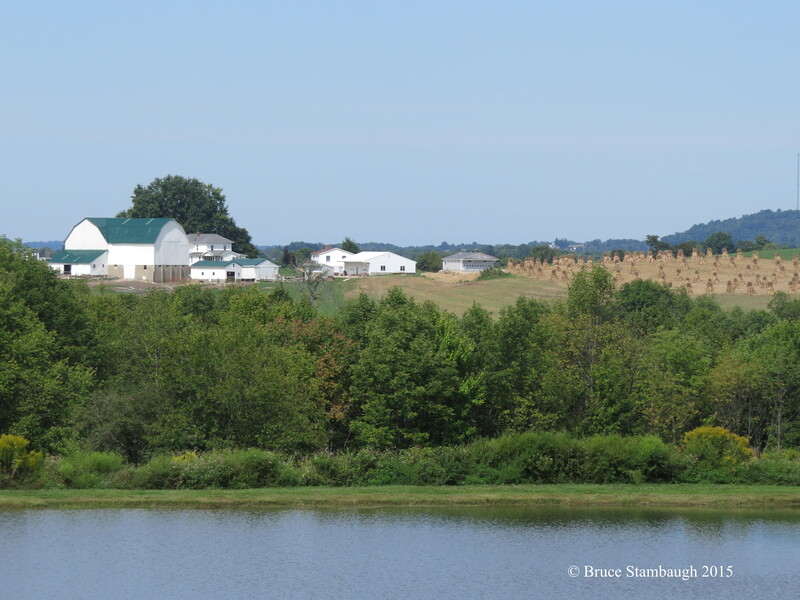 Spurred on by the early rains, rows and rows of field corn sprouted lush and fertile, growing taller than tall. Without regular August rains, they have withered and turned brittle brown overnight. It’s been a long time since I remember seeing cornstalks standing like mustered soldiers this early in the harvest time. Fireflies faded, and crickets increased amid the dryness. Our feathered friends have dawned their duller wardrobe for safety sake. Their luxurious singing has muted with their habitat’s colors. 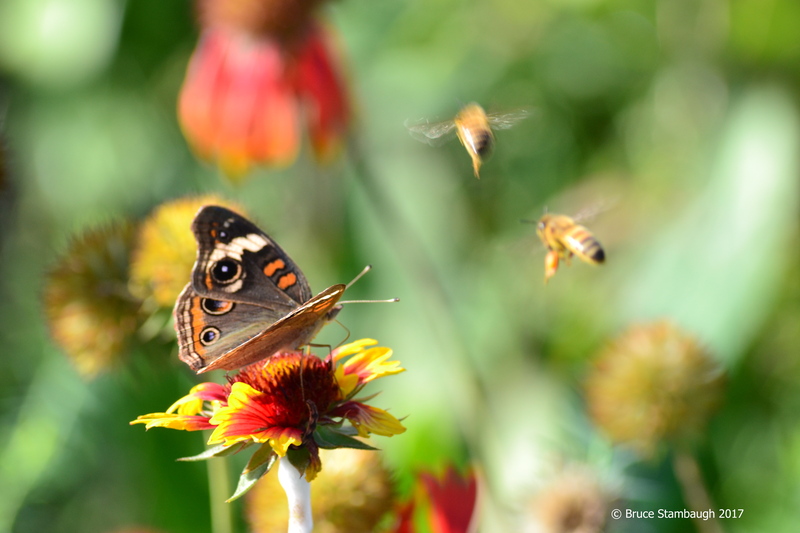 Migration is in full swing for birds and butterflies alike. Look quickly. They won’t stay. They have long, challenging journeys ahead. 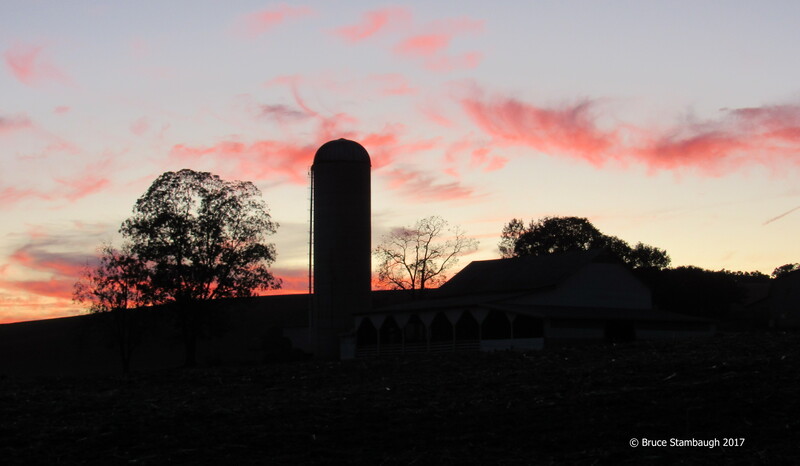 Another obvious indication of summer’s passing is just how soon sunset seems to arrive each evening. And that’s after the sun was late in rising daily. With the reduction in daylight hours, the air has cooled considerably overall. Of course we’ll still have some splendid days ahead. But day-by-day, week-by-week, the evening and morning coolness forces us to dress in layers to adjust to the daily variables. Summer has gradually been waving goodbye in a very colorful fashion for weeks now. Deciduous leaves have been slowly changing from their summer greens into fall’s warmer fashionable trends of crimsons, yellows, and russets. Many leaves have just simply fallen off. Healthy stands of goldenrod bend and recoil with the slightest breeze. Wild sunflowers separate highways from pastureland. The American Goldfinches couldn’t be happier, gorging on their fresh fruit. Funny how we humans too often seem to want what we don’t have, and when it does arrive, we long for something else. I think that pretty much sums up summer and answers our rhetorical questions about summer’s arrival and departure. We can’t control the weather or the seasons. We can only enjoy them whatever weather they bring. The key is to embrace the moment at hand, so we don’t have to look back and wonder where the time went. Summer is about to depart. Let’s send her out with joy, as we usher in the harvest season with gladness and thanksgiving.